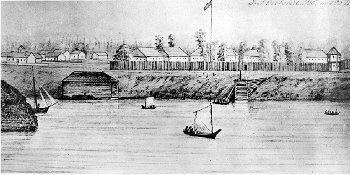 By 1857 the Hudson Bay Company could no longer hide the fact that it was purchasing gold from Nlaka'pamux people a few miles upstream from where the Fraser River joins the Thompson River (near present-day Lytton). This discovery sparked the Fraser Canyon Gold Rush (1858) which attracted tens of thousands of prospectors, outfitters, speculators and land agents from around the world, making it one of the largest migrations of mining populations in North American history. As many as 20,000 people arrived in Victoria, the capital of the British Crown Colony of Vancouver Island, which until this time had a population of 562 Europeans. Victoria became the place to obtain mining licenses, buy provisions and gather information before beginning the journey to the Fraser Canyon. In this critical thinking lesson, students analyze various textual and visual sources to determine what aspects of daily life in Victoria were changed by the gold rush, and what aspects changed very little. Students learn to make observations and draw inferences from a visual and then a text source, and to identify change and continuity over the history of Colonial British Columbia. They examine various historical sources to draw conclusions about daily life in Victoria prior to the gold rush in 1858. They then examine a parallel set of textual and visual sources to learn about daily life in Victoria after the gold rush. Finally, students identify and rate the degree of continuity and change in daily life between the two time periods.